ASKER, NORWAY (1 June 2018) - TGS and Petroleum Geo-Services ("PGS") announce the commencement of a new 3D multi-client project in East Canada. The new Tablelands 3D Geostreamer® survey will cover approximately 8,000 km² in an active Newfoundland area of the Flemish Pass and Orphan Basins. Acquisition is expected to complete in late Q3 2018. Following this eighth consecutive season of data acquisition offshore East Canada, the jointly-owned library will have more than 175,000 km of 2D GeoStreamer data and approximately 36,500 km2 of 3D GeoStreamer data. An expansive well log library is also available in the region, along with advanced multi-client interpretation products that will improve play, trend and prospect delineation. 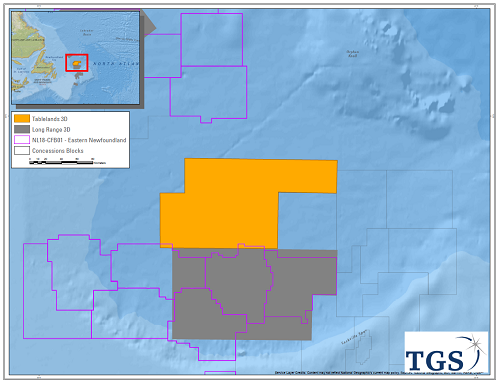 "Tablelands 3D will expand TGS' data coverage in offshore East Canada where we have a strong track record of success. This project will provide modern, high quality seismic data to an area that is highly relevant for exploration in the prolific Newfoundland basins," said Kristian Johansen, CEO, TGS. Pre-processing of the initial GeoStreamer signal will be performed by PGS onboard its vessel, Ramform Hyperion, following which TGS will perform data processing using its Clari-Fi™ broadband technology. Fast-track data will be available in Q4 2018 with final data in Q2 2019. The survey area will be seamlessly merged with the Long Range 3D project acquired in 2017.